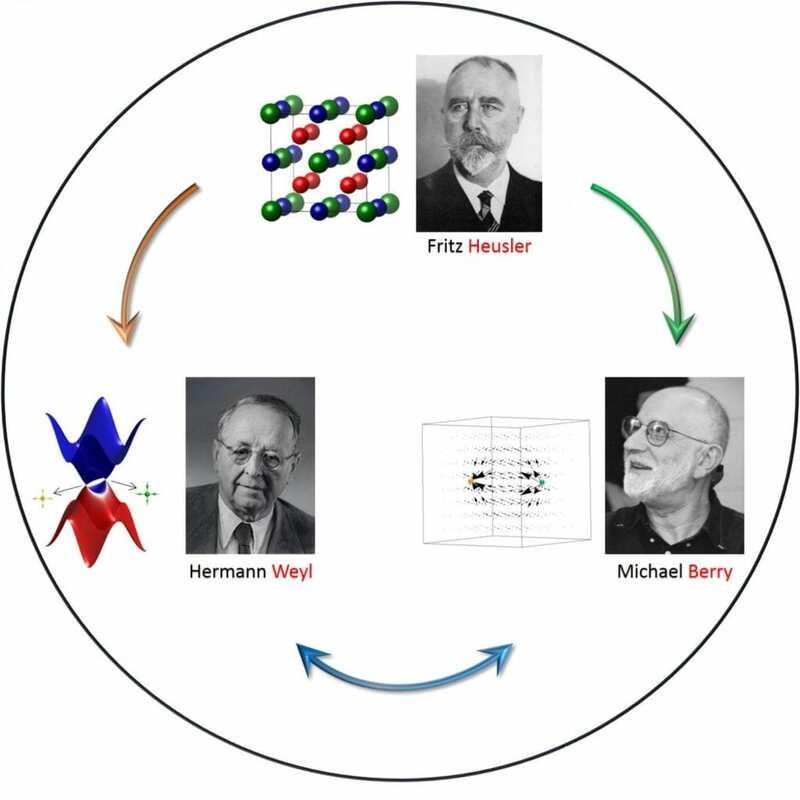 Fritz Heusler (1866-1947), Hermann Weyl (1885-1955) and Michael Berry (1941-) are three renowned scientists whose work has led to new and important insights into materials science, topology and condensed-matter physics. These three fields of science have come together recently with the discovery of new and exciting quantum properties in new classes of material which could enable new science including computing technologies and catalysis. Heusler is the name of the discoverer of mostly magnetic compounds that were of interest quite some time ago. But these compounds were recently found to host non-trivial topological properties that open a large field of novel physics. Hidden in the energy band structure of these materials are singular points that can be described with mathematical tools that originate from Weyl; these points are associated with the discovery of quasi-particles that are now called Weyl fermions. They are not found among the elementary particles of high energy physics, but we believe they exist in solid materials and determine their topology. The third name Berry stands for the measurable effects that reveal the physics at hand. Under certain well defined conditions there exists a vector field, similar to the magnetic field, called the Berry curvature. It determines the magnitude of a number of important effects, such as the anomalous Hall Effect and the Spin Hall Effect. It is the art of the experimentalist to suitably modify the materials in order to tune the Berry curvature and thus render the topology visible. In this review a great number of examples are given for various symmetry properties of Heusler compounds, a large class of materials that can easily be tuned to display ferromagnetic, antiferromagnetic, non-collinear or compensated magnetic order. These magnetic orderings give rise to pronounced electric and thermoelectric effects whose fingerprints are uncovered and explained including particle-like vortex spin structures, the antiskyrmions that are typical for a certain subset of Heusler compounds. Considering the large number of existing inorganic compounds and the recently proposed large number of nonmagnetic topological materials, Heusler compounds serve as a model system for the understanding and impact of magnetism on topology. Breaking time reversal symmetry via magnetism or an external magnetic field can lead to even larger effects than in non-magnetic materials based on the large separation between Weyl points of different chiralities. Based on a systematic study of Heusler materials we predict that there are a huge number of magnetic topological materials awaiting to be discovered. With regard to applications, the large Nernst effect and classical and quantum Hall effects around room temperature based on the high Curie temperatures of Heusler compounds and their relatives have the potential to have great impact in energy conversion and quantum electronic devices for spintronics or quantum computing.